Welcome Dear Readers! Well we almost did it. 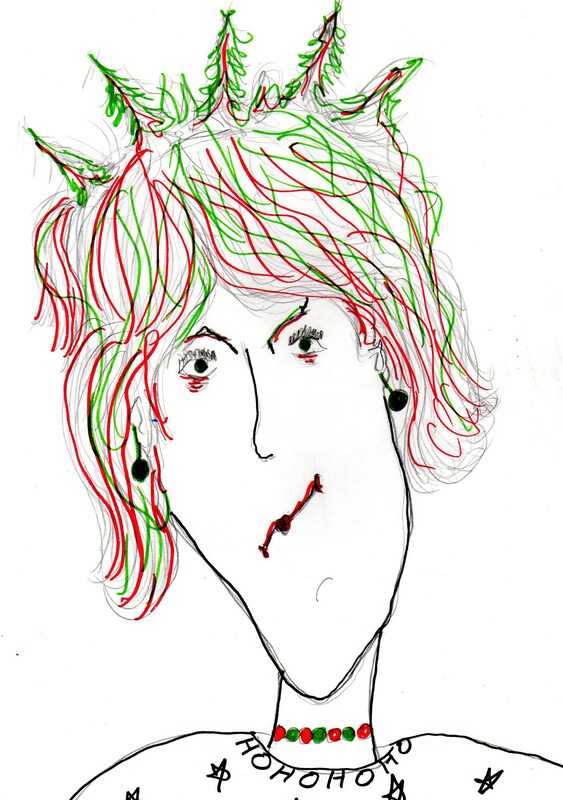 We almost got through Christmas without a visit from the Kind of Crazy Crabby Christmas Lady. Unfortunately when I opened up the blog today she was camped outside waiting for us with her cats, 17 fruit cakes and a stick of dynamite. I think we better humor her, don’t you? Oh here she comes now . . . act natural . . . Listen Toots. I’m not a big fan of Christmas. Okay? Got that? First of all, Christmas comes every single year. That’s way too often, Toots. Waaay too often! Christmas should come every five years. That way everybody wouldn’t be so sick of it. And Jesus would be much younger too. It’s called a win/win, Toots! Okay? Got that? Toots I’m not done talking yet. If Christmas only came once every five years, the Christmas songs wouldn’t be so annoying and repetitive! Toots! Stop talking and get some saucers of milk for my cats. Okay? Got that? Toots I’m not done talking yet! The Christmas songs are annoying because of all the bells jing-jing-jingling! And all the hark hark harking as in hark how the bells, sweet silver bells, all seem to say, throw cares away — what does that mean exactly, Toots? The bells are ringing and ringing and ringing so loud you can’t even hear yourself think, Toots! You just can’t! And they are telling you to “throw cares away and buy whatever you want . . whatever you want, Toots! Aluminun foil. The bells don’t care that you already have 14,000 boxes of Aluminum foil in your storage unit. It doesn’t matter if you can’t afford it because the bells told me to do it, Toots! Toots are you listening? What are you opening the door and handing me my coat, Toots? Which brings us to the Christmas sugar, Toots! A hahahaha! I’m dreaming of a white C & H pure cane sugar from Hawaii Christmas, Toots! What with all the sugar cookies and the sugar candy and the sugar plums and the sugar houses and the sugar nativity scenes. Have you ever tried to eat a tree ornament, Toots? They are edible you know. They are made of sugar plastic . . . mmm. . . sugar plastic! And do you know what sugar plastic does Toots? Well do you? Listen and listen good, Toots! Sugar plastic causes your little fat cells to sit up straight and pay attention all innocent-like at their little fat cell card tables covered with the tiny candy cane plastic table cloths wearing their teensy Santa bibs and Santa hats each holding miniscule red and green plastic forks which they will devour when they are done because they are made out of sugar plastic too. Okay? Got that? Fine. Good I’m leaving now, Toots. Okay? Got that? Here kitty kitty kitty . .
Phew! I didn’t think we were every going to get rid of her did you, Dear Readers? Oh look she left us a present under the tree. Let’s open it early shall we? Why it’s a stick of dynamite. Well bless her Kind of Crazy Crabby Christmas heart! Until next time . . . I love you! The Christmas lady is one tough Christmas cookie! I think she should open a “it’s Christmas Every Day” store with the girlfriend shut the hell up girl. Hail the Crazy Crabby Christmas Lady! Ah yes! And we shall leave her necktie and fruitcake offerings! Dear Linda, I have this awful thought that you know my ex-wife. However as it is Christmas today in Australia, I want to wish you a Merry Christmas and every blessing for 2014. I have posted my Christmas in Australia story today. Have a great one Linda, keep those funny bones a rattlin’. Thank goodness for that, blog land is safe another year. Happy 2014 to you.